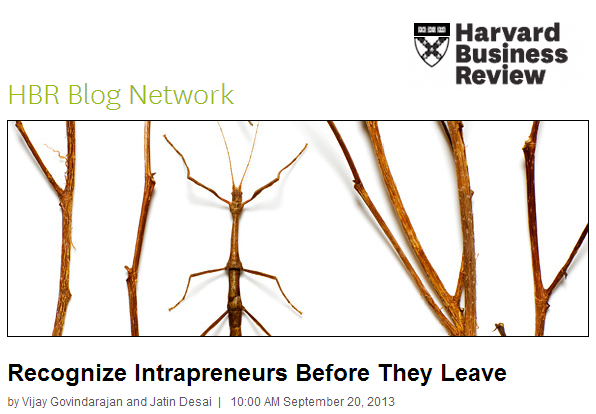 This article, from the Harvard Business Review, is about how companies can operationalize new ideas and develop an “innovation engine”, by recognizing and supporting its “intrapreneurs”. At TIE, we are all about nurturing those future intrapreneurs. Our idea is that post a TIE placement, participants return with a horsepower, energy and wealth of new insights that can make a tremendous difference in any company. These people are the ones that push the industry forward – they often just needed that spark to kick start the process. But those companies that have these powerhouses in their offices need to ensure they know how to provide the proper change-friendly environment – otherwise they risk not only not getting the most out of their people, they risk possibly losing them for good .